A temporary low point in swell yesterday morning with OK winds on the Surf Coast, building into the afternoon with fresher sea breezes. Today we've seen a peak in our mid-period and long-range W/SW groundswells with 3ft to sometimes 4ft sets on the Surf Coast and 6ft+ sets to the east with workable winds. A peak in swell energy was seen this morning, and even though Cape Sorell is showing stronger periods, this is very distant long-range energy and won't provide any additional size. We'll see the swell slowly easing through the weekend and tomorrow isn't looking to flash at all with a moderate to fresh S/SE wind. The Surf Coast should ease back from 2-3ft with 4-5ft sets to the east. Sunday is still looking fun on the exposed beaches with a fresh E/NE offshore, but size wise I wouldn't expect much with easing inconsistent 3ft+ sets, junky on the Surf Coast with an E/SE windswell in the mix to 1-2ft or so. Monday will be clean again across the beaches with a N'ly breeze but there'll be no swell left in the tank. 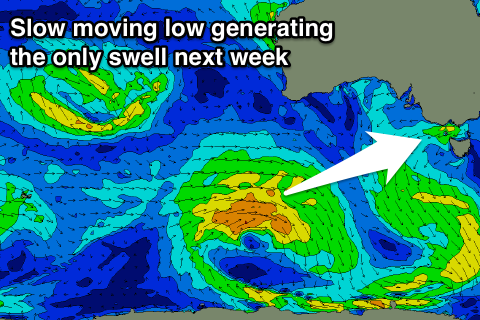 As touched on last update there's nothing significant on the cards for next week, but a small mid-period W/SW swell is due to build slowly Tuesday and peak Wednesday. A slow moving and relatively weak storm south-west of WA will aim a persistent fetch of strong W/SW winds through our western swell window. Size wise the Surf Coast is only due to see infrequent 2ft+ sets on the magnets, and 3-4ft+ waves to the east, mixed in with another building E/SE windswell event. This will be associated with a surface trough and strong high moving in from the west bringing strengthening E tending E/SE winds, creating poor conditions. Thursday looks the day to surf next week as winds tend offshore from the N/NE, but only small with a mix of easing SE windswell and W/SW swell to 2ft on the Surf Coast and 3-4ft on the Mornington Peninsula. Longer term there's better swell potential into the following week as a series of good mid-latitude fronts fire up towards us, but more on this Monday. Have a great weekend!